Author: Nico van den Boogert. 22 pp. Roman, 455 pp. This book is the first exploration of the Tashelhit Berber manuscript texts produced in the Sous (South Morocco). The first part describes the region and its traditional schooling system and offers a general description of the manuscript texts, their form, contents, orthography (fully vocalised Maghribi-Arabic script) and language. It presents a survey of all manuscript texts known to date, the oldest of which was written around 1580 AD. The second part describes the life and work of Muhammad Awzal (±1680–1749 AD), the most important Berber author of the period, and contains a list of all Awzal manuscripts. Awzal’s lexicon and language are explored separately. 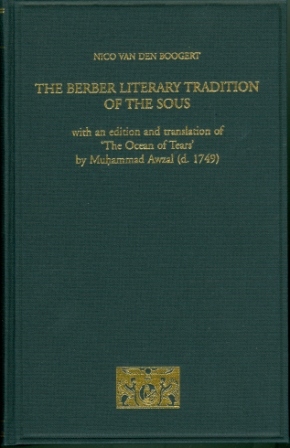 An edition in transcription of Awzal’s versified exhortation Bahr ad-dumū' Ocean of Tears, with English translation, notes and glossary is also included.